SUBSCRIPTION AVAILABLE. CONTACT OUR CUSTOMER SERVICE TEAM ON (02) 9857 4477 TO SUBSCRIBE. 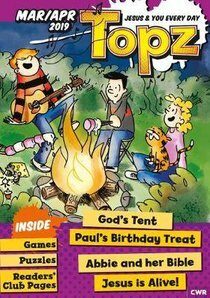 Topz is a popular bimonthly devotional for 7-11-year-olds. The Topz Gang teach children biblical truths through word games, puzzles, riddles, cartoons, competitions, simple prayers and daily Bible readings. About "EDWJ: Topz 2019 #02: Mar-Apr (Ages 7-11)"